Posted by Bill Mann on Saturday, February 2nd, 2013 at 7:12am. 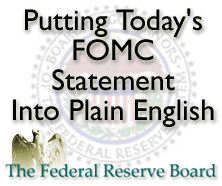 The Federal Reserve's Federal Open Market Committee (FOMC) voted to maintain the Federal Funds Rate within its current range of zero to 0.25 percent, and to continue its current stimulus program of purchasing $85 billion monthly in Treasury bonds and mortgage-backed securities (MBS). Citing weather-related events such as Hurricane Sandy and drought in the Midwest, the committee said in its statement that information received since its December 2012 meeting "suggests that growth in economic activity has paused in recent months in large part because of weather-related disruptions and other transitory factors." The Fed initiated its third round of quantitative easing (QE3) in September as part of an ongoing effort to hold down interest rates and to encourage business spending. The benchmark Federal Funds Rate will remain between zero and.0.25 percent until the unemployment rate falls to 6.5 percent and provided that inflation remains stable. The Fed Funds Rate has stayed near zero since December 2008. The national unemployment rate was 7.8 percent in December, and Wall Street expects it to be 7.7 percent for January. The Department of Labor will release its monthly jobs report on Friday; this report includes the monthly unemployment rate. Inflation is expected to remain at or below the Fed's target level of 2.0 percent or less for the medium-term. While noting that "strains on global financial markets have eased somewhat," the FOMC said that it "continues to see downside risks to the economic outlook." Low overall interest rates and gradual inflation work in favor of home buyers as home prices and mortgage rates are likely to rise at a gradual pace. Mortgage rates in Rehoboth Beach improved slightly after the FOMC release.